The older the people grow the more curious and inquisitive they become about the childhood days especially of their own. In many instances, they try to remember the events and activities that they were involved in. They still love those activities in which they were actively involved. Most of the adults of all ages in the societies like ours consider the activities in which children are involved in on their own as the ‘unschool’ activities. They can, as the societies believe, harm the growing children’s lives. To make it conspicuous, the children generally love the unschool events and activities which in general encompass playing locally available games and sports, listening to the music, watching movies, joining clubs to meet friends, visiting unfrequented places and so on. In my case, I never realized that those things were bad or would have some adverse effect on my personality. Interestingly what my society considered the ‘adverse’ was favourable to me, which always encouraged me to create a certain distance between myself and school, although I was always at school literally. Perhaps I had a kind urge that somebody would come up to me and ask whether I liked school where I was required to do the ‘school’ activities, which always meant ‘do your home assignment, come to the school in proper uniform, follow the school instructions strictly, do not make noise in the class, do not miss the class and listen to your teachers as long as they teach you’ and so on… In the meantime most of the children’s heads would feel the way students feel in the following picture presented by Ken Wilson at the IATEFL Conference Harrogate in 2010. In our ELT or more generally educational scenario, thousands of people jump into the field of teaching without any plan and remain as teachers throughout their lives perhaps hardly understanding the urge of the students. This case may not apply to all schools, teachers and children. However, by and large, the students are always forced to follow the footsteps that their teachers create in the course of teaching. The students’ lives are always at stake as we train them to follow us and become like us. We claim that we are the role models for the students, so they need to follow us. I may not agree with this because following this principle, we are creating followers and not the creators. In many cases, I encounter a lot of problems and it is quite difficult to find the ways or solutions, perhaps there still remain the residuals of being a follower of my tutors. This might have forced me to become more dependent on the tutors, and interestingly the society has made us believe that the teachers and indeed in some cases seniors (in terms of age) are permanent guru for us. Mr Shyam Sharma argues against this idea in article which posted along with this. At this point, I would like to link this with TS Eliot’s expression and claim that teachers are simply catalyst and they should not attempt to leave the footprints of their personality into the personality of the students. Obviously, students can be impressed by their teachers’ personalities, but they should not bear in the mind that imitating or mimicking the teachers can make up the students. Unfortunately, knowingly and unknowingly we have created such situation that our students are forced to believe that what the teachers have said are the school things and what the students do or bring up are the unschool things, this is why we tend to think that ‘playing locally available games and sports, listening to the music, watching movies, joining clubs to meet friends, visiting frequented and unfrequented places and so on’ are the unschool things. We are preoccupied with the idea that just reading books (in our cases parroting the pages) is the school activity or say education activity. The footprint following principle never allows people to become creative and develop the sense of self esteem. People without self esteem tend to be afraid of their teachers. In general the teachers and fathers in our societies are fear factors. Also they hold the position of godlike personalities in the society. Although the oriental philosophy advocates that the children over sixteen should be treated as friends, the practice is quite opposite. We hardly treat them as our friends, let alone celebrating the friendship day. Where mind cannot work without fear, there is little possibility of creation. The more relationship is informal the more likelihood of sharing feelings and knowledge. The passion and hope that we find among the people accelerate the increase of knowledge. Teaching students creating fear and translating oneself into a fear factor mean dehumanizing the learners, and making the mockery of teaching. How can the children consider that they are dealt with democratically? While ironically they are told that their societies are practicing democratic norms and values. I believe these students get confused with the meanings of democracy. These situations lead the children to feel that the institutions where they go in search of knowledge are actually ‘prison’. Citing Daniel T. Willingham the writer of Why Don’t Students Like School?, Peter Gray deliberates, ‘Everyone who has ever been to school knows that school is prison, but almost nobody says it. It’s not polite to say it. We all tiptoe around this truth that school is prison, because telling the truth makes us all seem so mean. How could all these nice people be sending their children to prison for a good share of the first 18 years of their lives? How could our democratic government, which is founded on principles of freedom and self-determination, make laws requiring children and adolescents to spend a good portion of their days in prison?’ In prison, you are not allowed to violate any established rules. You need to follow the footprints of the rules exactly the way you are asked to do. No logic, no reasoning, no arguments will be allowed. The schools treat the children in the same way. The prisoner is perhaps not allowed to look into the eyes of the jailor. Are the children practically allowed to speak to their teacher looking into the eyes with the cheerful face? I would say no. The question of how naïve you are, how gentle you are and how argumentative you are will not be of any concern. In the present context of the mushrooming of private schools, these facts speak more loudly and vehemently too. For example, ‘Dear students, you are not allowed to speak in Nepali or your mother tongue in the school premises, and if you speak, you will be fined, understand? Speak in English, English and English only … you know?’ What crime have they committed that they are not allowed to speak in their tongue when they are with their friend chatting over a cup of tea? And English for them is an alien. How can you be with the alien if you do not get any assurance, suggestions or problem solving skills? We know and should know, ‘Children don’t like school because they love freedom’. When you learnt/acquired your tongue, you were with your people at home and there was no fear. Now you are in fear. A frightened hunter or hunting dog cannot hunt the deer, rather the hunter gets hunted. The schools are becoming more and more prisonlike places. It’s relevant to read a few lines by Gray which describe the difference between the school and prison. He argues ‘The only difference I can think of is that to get into prison you have to commit a crime, but they put you in school just because of your age. In other respects school and prison are the same. In both places you are stripped of your freedom and dignity. You are told exactly what you must do, and you are punished for failing to comply. Actually, in school you must spend more time doing exactly what you are told to do than is true in adult prisons, so in that sense school is worse than prison.’ Modern teachers must be trained how to reduce the level of fear of teachers in students. Also speaking in one’s language is not a crime. The knowledge needs to be increased, for which there must be favorable situation for the receiver. There is no harm in using the native tongue even while you are in the English language teaching situation. This idea has been highlighted more conspicuously with illustrations and examples by P Baker in her article ‘Jumping the barrier: the fifth skill’ which is attached along with this writing. The aforementioned unschool activities are the incredible sources for creating deep sense of motivation in students. The activities themselves can be the source of teaching. If good parents think of ‘likes’ of their offspring, it’s the job of teachers to think of the likes of their students instead of thinking that their students are unteachable. To take an example, if the students like the sports and other similar activities, we can increase their understanding of L2 by means of bringing the aspects of those sports and activities. We can increase the vocabulary items for example. Similarly, we can create the texts which deliberate the issues of the items that the students like. This can easily activate the learning motor of the students. If we speak against the likes of students, it can easily have the adverse effect upon the psychology of growing children. In many cases the false learners terminate their school. I have already mentioned that they feel dehumanized. To speak in a straightforward way, no human has rights to dehumanize another human. To change the students in a positive way the motivation always matters. In order to motivate the students, the so-called unschool things need to be brought into the educational lives of the children in a positive way, for example. 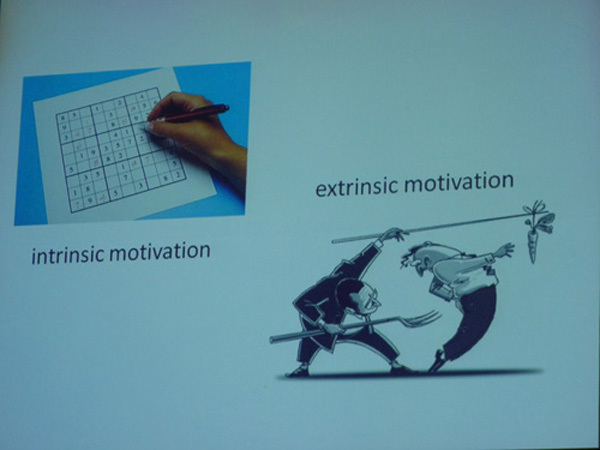 In this context, we need to understand deeply that motivation matters; indeed both extrinsic and intrinsic. The extrinsic motivation is also equally important but if we are able to increase the intrinsic motivation, the students can effectively be changed and developed in a nice way. 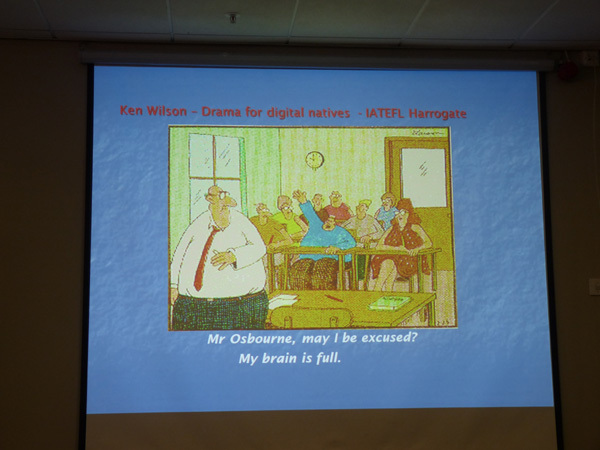 While creating the extrinsic motivation, the teachers should never bear the idea of fear factor which can be seen in the following picture that was presented at the IATEFL conference in Harrogate. Please come up with your arguments and constructive ideas that we share with other fellow teachers. The idea is great and needs serious consideration by all teachers. Thank you Kamal sir, for making us realise this fact. I could not see the pictures, though. May be they are not displayed by some technical reason. Gaule ji, the photos were originally too heavy for the “Nepalese” internet connection, and needed some technical trimming. Now you can see them. We were actually working bit by bit. Thank you Kamal Sir for such an interesting posting. I enjoyed reading your posting very much and I am with you sir that teachers are only catalyst. I think the thinking of indoor or inschool activities as only educational activities are the main evil of our mind. There are different unschooled activities you have mentioned above certainly promote enhancing English properly. Thank you Kamal sir. Ideas presented here really demand for attention and correction, if applicable, so that there would be better student centered learning environment. I recall one of the problematics in this model based on my retrospection of around 12 years back. Then I was a second man in a boarding school run by a friend from Darjeeling. My approach then would be very similar, though unknowingly. But, it very often put me in trouble. Most memorable of all is a guardian’s complain; I feel reserved to share the complain due to the vulgarity that it had. It made me think, can we instruct the students giving them freedom when the parents have such mind set? I still contemplate: what role do parents, especially at school level, play in our model of instruction. What beautiful words you speak. I wish my superiors and colleagues can be as wise as you are. I always find it difficult to hear the comments of teachers who do not care much about the children under their care. They do not notice when they step on the dreams of their students and deny their potential. There seems a misunderstanding about caring for students and making them happy – and the need to providing young people with the boundaries they need to form the personalities and capacities. Often this seems to happen most with teachers who have, as you mentioned, only worked inside the system and have not had to expose themselves to the world outside the educational institution. Outside this world is a great deal of insecurity and uncertainty, yet it provides the real skills of survival and living a good life that humbles us. Teaching in schools outside Nepal, the most glaringly obvious error I encounter is that many teachers (without alternative life experiences in the workforce) simply believe that they are intellectually superior and more highly trained that their students’ parents. For example, they forget that they are only trained in one skill set and have relatively limited life experience, while many others have multiple skill sets and have many life experiences. Yet this assumption seems to persist. My impression is that it is the inflexibility of the mindset that comes with operating with one skill set with little alternative input that creates the prison-like structures of the school. The situation where so many teachers I encounter have participated in no further formal training after their initial graduation (over 10, 20 or 30 years of teaching) is a travesty, yet many teachers boast about it while scorning the less experienced and more qualified. How can one keep in touch with what we do if we are never again on the receiving end of formal education, reducing ourselves to the status of powerless student in the fact of the teacher, riding the risks of failure and experiencing the angst of being misunderstood and marked down or the satisfaction of having your work valued and praised by your academic supervisors? My student’s parents are always pleased that I can uncover the little pearl inside the shell of the naughty or lazy student with a history of bad performance in the classroom. Often these students are misunderstood as hopeless and teachers adjust their expectations accordingly. As teacher expectations lower, as we all know, so naturally does the performance of the student. This is a natural law and a situation that has been confirmed by the research. Therefore, I always have high expectations of my students, yet they always bypass these expectations and amaze me! This is a feeling of bliss. This does not mean that I only entertain my students or lead them by internal motivation – there are times when I parent my young students and I provoke them to overcome their habitual laziness, which is no fault of the child but still harmful. Sometimes there is such a lack of basic content known that traditional learning methods are required for a short time before students can break away from their dependency on the teacher and to become independent learners, particularly if they have never had the experience of thinking in a focused way for a sustained period. Yet every child deserves the experience of a committed teacher and sustained concentration so that they can receive a taste of what it is to rely on their own minds and create their very own works. All the teacher has to do is to take a look at the ‘unschooled’ life of the student and their family to find the answers that will motivate the student. Indeed, the student who feels most confined in the classroom is often the circuit-breaker who provides deep insights into the organisation of the classroom and the structures or systems that have set too firmly inside it. And this does not take much effort, it can often be seen by observing students in the playground between lessons or with a short chat about the child’s interests. Something positive that can happen to schools is for teachers to step outside their schooled zone and to respect the enormous role parents, grandparents, uncles, aunts, older siblings and cousins, family friends, coaches and religious guides play as teachers of children. And to remember that you can make no safe assumptions about how ignorant a child or their family might be. Ultimately, if a teacher cannot find the pearl inside the shell then if reflects only the ignorance of the teacher and never the student. For family and friends will always plainly see the true heart and intelligence of the child, that carries the hopes and dreams of the whole family, and even the community, inside it.